Anyone that has suffered from anxiety and depression will tell you that it a particularly unpleasant condition. Often depression feels like somethingh from which there is little escape or respite. The good news is that people do get over depression through various treatments and as they become more aware of the possible causes of trhe depression. 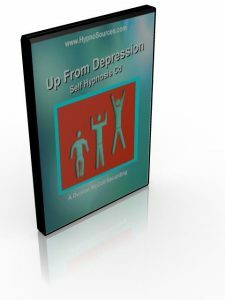 Whilst this depression hypnosis cd or mp3 download is not aimed at manic or chronic depression, it can be effective in helping those who suffer mild depression. The cause of the symptoms of depression might be at work, home, in personal relationships or some aspect of life that makes you feel unhappy. You might feel trapped and not be able to see any options to change your unhappy situation. The self hypnosis cd or mp3 also helps reduce the stress and anxiety that can often come with depression symptoms. Feeling calmer and more relaxed can help get matters in perspective and lead to a solution to what seemed like an impossible dilemma.